You might not come across many men wearing green shirts or trousers but, when it comes to green gemstones, the appeal is universal. Men wearing a green gemstone ring reveal a refreshing style statement, the color is all about reconciliation and regeneration. When choosing men's rings with green gems, the choice of gemstone is important for more than one reason. With men's preference for rings with large dimensions, the high prices of some large gems can pose a challenge. You cannot expect men to fuss and pamper their jewelry, gems selected need to withstand general use. 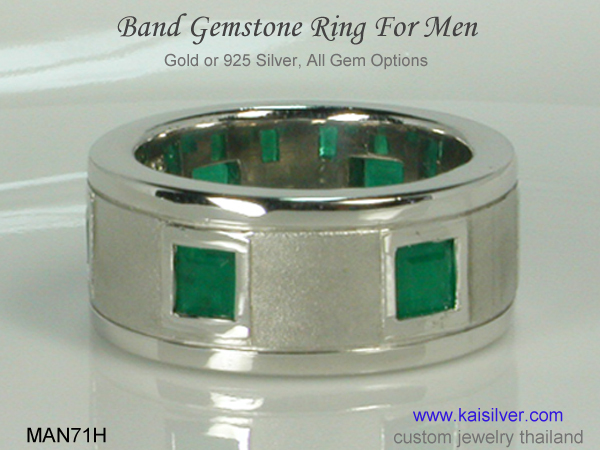 Kaisilver can custom make a men's green gem stone ring with no limitation on gem selection but, a few gems account for most of the demand. Men's gold or silver rings with jade, green tourmaline and peridot are the most popular. If you prefer to have a green gemstone ring with an emerald, pay attention to gem size and durability of the jewel. There will be times when the selection of a men's green stone ring is influenced by tradition. Men who were born in the month of August or May, would have peridot and emerald (respectively) as their birthstone. In this section we introduce you to some awesome men's rings with green gems, you will also find some informative reports related to green gemstones. At Kaisilver we can custom make any type of jewel as per your design or ours, their is no limitation on gemstone or design selection. You can contact our team of experts at sales@kaisilver.com if, you have any questions or requirements related to gems and jewelry. The MAN71 men's green gemstone ring is crafted with emerald gems. The design concept for this men's emerald ring provides good protection for the gems. The modestly sized emeralds are priced moderately and are easier to maintain ... more. 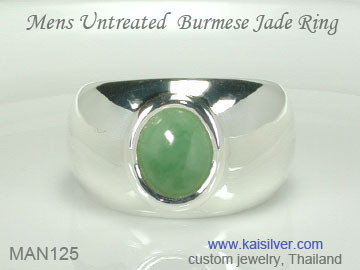 The very desirable look of green jade from Burma for this men's green jade ring. Kaisilver procures jadeite directly from the mining site, this ensures that the stone is not treated in any way. An attractive price point for this men's gem ring ... more. 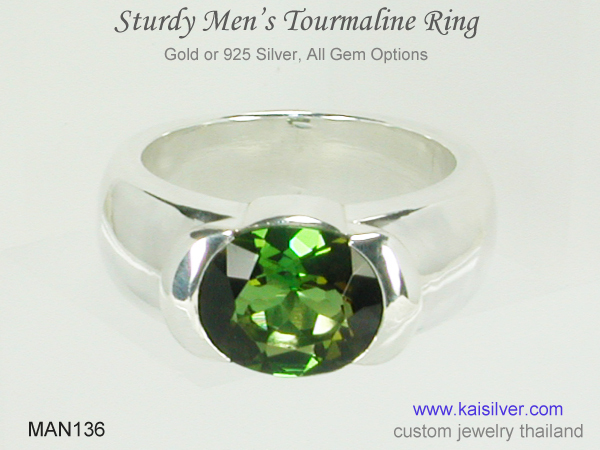 A hefty and sturdy green tourmaline gemstone ring for men. Tourmaline is a sturdy gemstone and is not expensive as an emerald. The darker green shade of green tourmaline has a natural and aesthetic appeal. Available in gold or 925 silver ... more.